I have been well and truly on the healthy bandwagon recently, and following healthy food instagram accounts left, right and centre has really helped to give me some inspiration and motivation. I thought I'd share my favourite recent finds who share the most beautiful breakfasts, smoothies, treats, mains... you get the picture. @HemsleyHemsley - A very recent find has been Jasmine and Melissa Hemsley, who actually have a much raved about book I have seen all over social media. They post a variety of photos, from meals, to most lifestyle posts- everything is vegan/vegetarian and super healthy. @superfoodsiobhan - I think I may have heard about Siobhan from Anna's blog, but her Instagram is just beautiful. Expect regular photos of yummy healthy meals, including the most photogenic porridge/oatmeal ever, with recipes to most of her posts up on her blog too! @honestlyhealthy - I heard about Natasha through the release of her new book, making a total of 3 best selling health books for her Honestly Healthy brand. I haven't got round to making any of this yet, as it does contain a few more complex health ingredients (the sort of stuff you won't always find in Tesco), but it definitely serves as great inspiration! @healthychefsteph - Another one I found from Anna's blog, Steph posts some great meals, especially ones for post-workout fuel, and some protein bar brands to keep an eye out for. They're also pretty realistic and easy recipes that will definitely come in handy at uni next year! @livingthehealthychoice - Another one who will make you think more about the layout of your food, Pauline's posts are so beautifully edited that it makes the food look even better, plus she posts a huge variety of meals - definitely not the same thing everyday! @sophiesblend - At only 19, Sophie has become the nutritionist for Sam Faiers' new fitness website, and rightly so. I have already given her almond and turmeric crusted chicken a go (it was amazing) and the parsnip soup is next on my to-do list! @therawsomevegan - And finally, an account I have been following for a while. Although I am not a vegan, Imani's account is full to the brim with meal ideas which are super healthy and obviously great for any of you vegan/vegetarians out there! 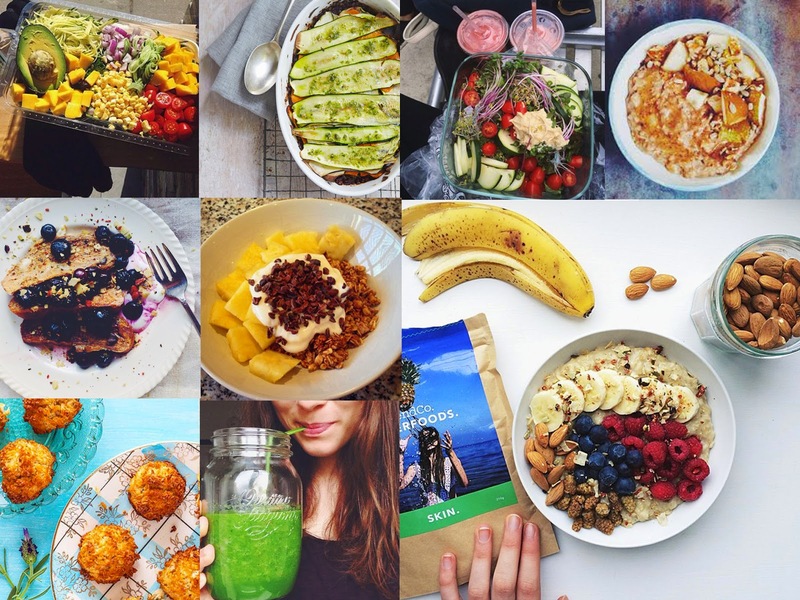 And there you have it - my pick of the best healthy Instagrammers out there to give you some inspiration for that health kick. For me, diet is harder to stick to that the exercise part, so following these has definitely shown me that eating healthy can be far from boring! If you have any more that I've not mentioned, leave them in the comments below - I'd love to find more to click the 'follow' button on!